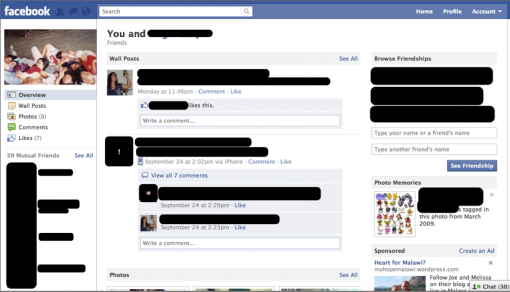 Facebook Friendship Pages: The Magic of Friendship or a New Stalking Tool? Yesterday, I got a Facebook notification that my cousin had “liked” what I posted on her wall the other day. Naturally, I clicked on the notification to check her wall out. One thing stood out immediately – a new link labeled See Friendship. I think what used to be there was See Wall-to-Wall. Curiosity got the better of me, so I went ahead and clicked on the link. I swear, despite the initial misgivings about the use of the term friendship, I kept an open mind. This is what greeted me, and I just didn’t like it. One of my favorite Facebook moments is browsing photos from friends in the News Feed after they’ve begun a new relationship, gotten engaged or gotten married. It gives me a fun and meaningful glimpse of the friendship between two people I know. I realized that a similarly magical experience was possible if all of the photos and posts between two friends were brought together. You’d remember that first Wall post with your best friend or the funny photo from a night out. You may even see that moment when your favorite couple met at a party you all attended. I guess there’s nothing really wrong with that. Maybe it’s just me, but I think it’s kind of cheesy! Still, some people wouldn’t mind having this kind of information accessible to them. The use of the term friendship also doesn’t sit well with me. It’s a personal thing, so I really shouldn’t gripe about it, but couldn’t they have found another word? If you take a look at the right side of that screenshot, you can see Browse Friendships. In short, you can view other Friendship Pages of people in your circle. What this tells me is that they seem to have taken the compilation of information to a whole new level! It freaks me out, even though I make it a point NOT to post anything on Facebook that I don’t mind anyone else seeing/knowing about. Still, you never know. Indeed, I am not the only one reacting this way – there is already a Facebook Page dubbed Opt Out of the FB Friendship Feature. I am pretty sure there is a group that love the feature already, but I wish that we had the option to disable it as well. Yeah, Facebook Friendship Pages can either showcase the magic that you call your friendship, or it can be one of the most convenient stalking tools online. As for me, I don’t need Facebook to make me appreciate the magic in my friendships. Please give us the opt out feature? I think the part that bothers me most about this Friendship Page thing is that it’s completely out of the control of the parties involved. It automatically picks the “profile” photo with no way to change it, for example. I also wonder exactly how it handles custom privacy settings. Sure, someone may have permission to view each profile, but I hope it honors the more granular settings for each type of content and so forth. These pages should be private by default since, really, the two parties involved are going to be the only ones who care for the most part. Then give those two some sort of admin controls over the presentation of the information and whether it’s public at all. I agree – it is completely out of your control. Still crossing my fingers for the opt out feature. I like your policy of not posting anything on Facebook that you don’t want to be public.